In a world where all other inhabitants have been reincarnated over and over again for thousands of years, Ana is a new soul (or as her heartless mother Li likes to say, a “No soul”). Once she hits 18, she sets out for Heart to find answers about the origins of her existence. She’s not exactly greeted with open arms: Residents of Heart believe she threatens their survival, though she does make an ally in Sam. 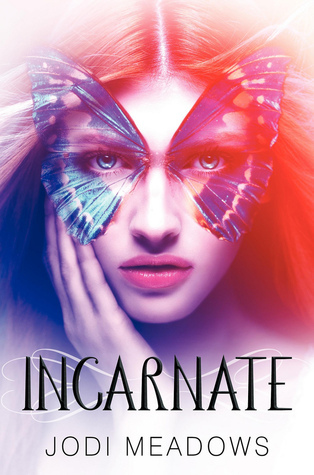 INCARNATE is a utopia – that is if you disregard the sylphs and dragons that go on regular killing sprees through Heart. Sam also believes that society has stagnated (and society thinks he’s too unfocused – trying out new projects every life). People fear change and though that makes most people fear Ana, Sam welcomes the inspiration and renewal she promises. It’s not the easiest thing to make a romance between a 5000 year old and teen believable, but Meadows more than hits the mark here. I also really liked the exploration of the concept of gender neutrality. In a world where a soul might be reincarnated in the body of a man or a woman, love and friendships persist no matter what skin the people are in. The world building is inventive and made my imagination run wild. I can’t wait to see what Meadows has in store for the rest of the trilogy! INCARNATE comes out January 31, 2012. Find out more about it at the author’s website. Also, read her Dystopian August preview interview. Zombie Chickens say: Something refreshingly different and exquisitely thoughtful. Highly recommended. Oh fun! I'm glad you enjoyed this. I simply adore the cover. This sounds really interesting - a completely new take on the whole reincarnation really fascinates me and I shall definitely be picking up a copy. Thanks for reviewing it as it hadn't yet crossed my radar. Even before reading your review I knew I had to read this book just because of it's cover! Amazing! I'm not sure the book is for me, but I love the cover! This book sounds very creative and I just love the cover. Looking forward to reading a utopia for a change! This looks so good, i hope the actual book is as good as the cover! I also like the idea of gender neutrality and think that this book explores some really interesting concepts. This one sounds very different than most of the other dystopians. More hopeful, I think. This is something that I really want to check out, and I don't even mind that it's a trilogy, which says a lot! I really thought this was a special read- and you pointed out why perfectly in your review. Well said! I would check this out based on the gender neutrality aspect. That makes the story quite interesting. This is another I'm eagerly anticipating in the coming year. It sounds thought provoking.